I am fairly new to boating and was wondering how much is too much water in a hull. A few months ago I never noticed water in my hull at all. Everytime after I am out of the water I wash down the engine, flush, and wash exterior. I always lift my trailer and rest it on the tailgate of my truck so its always on an incline during this whole process. Lately I have been seeing some water in the bottom of the hull. Last night I syphoned 2 gallons, from the space in the front compartment right infront of the gas tank. Is this normal? The weird thing is that I thought it looked like there was no water in the hull after washing it on Sunday?! Any suggestions? Is something leaking? Open your front storage compartment (the big one) and check the black sealing boot at the front hinge of it. My 07 would stay bone dry when riding, but when I washed it, I'd get quite a bit of water in the nose of the ski. Found this boot to be improperly seated. 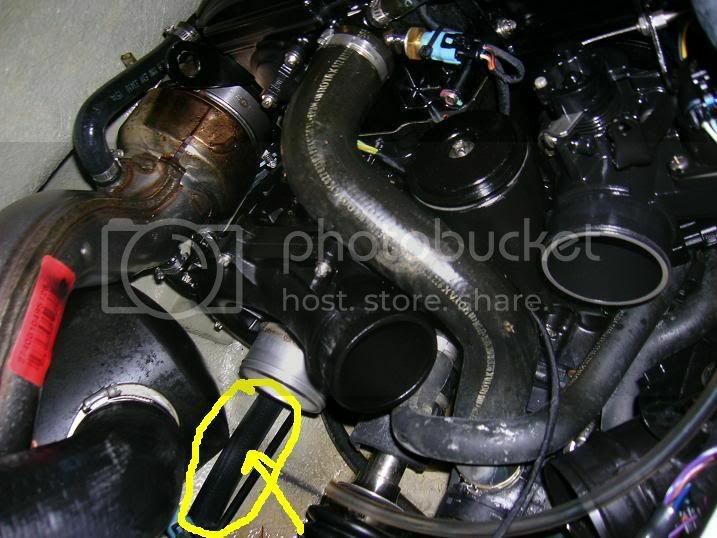 i had a leak in the hose running from the pump to the intercooler. it runs under the engine so it was a bit challenging to find at first. you might want to check that also. it runs from the pump, up under the exhaust manifold and to the intercooler. and yes, two gallons is an indication of something wrong. Ok just checked it. Boot is good. Under the engine! Chit...this is going to be fun. If I verify this is the problem, can I still use the ski until I take it to the stealer for warranty? much easier to check than you think...here's a couple pictures of which one I had a problem with. I was able to reach down and pull it aftward a few inches and expose the hole. Then, just took it to the auto parts store and got a heater hose of the same length and diameter. 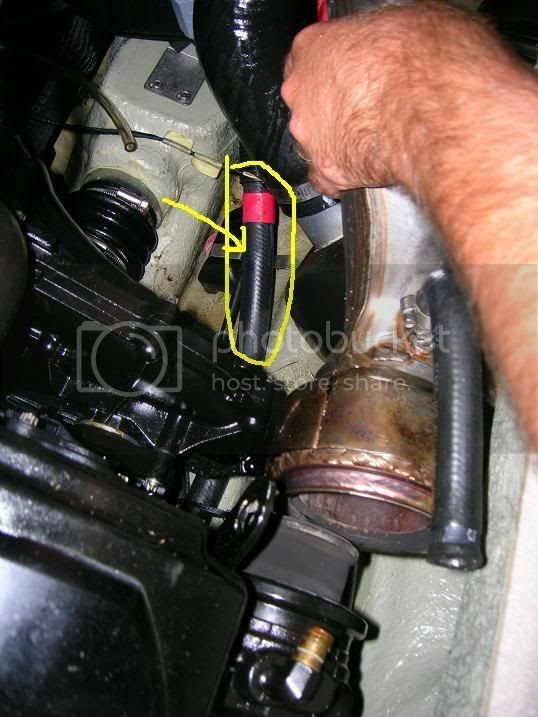 The hose is marked by a red band. Hope this helps or you find you're leak soon! Wow! That is a very detailed instruction. You should make manuals for BRP! Ok, couldnt find a leak in this hose or any other area for that matter. Last weekend during my wash and flush, I removed the rear plug assembly (8mm hex heads) and the water in the hull came gushing out. The ski hull has been bone dry since Saturday. Tomorrow when I put it in the water, I will check for leaks again. Do you think it was just the water when I hose down the engine? Why wouldnt it all come out of the plugs. Do you think it doesnt syphon water out of the hull anymore?? The bailer hoses are the ones that connect back to the drain plug correct? I will check all clamps. Thanks!